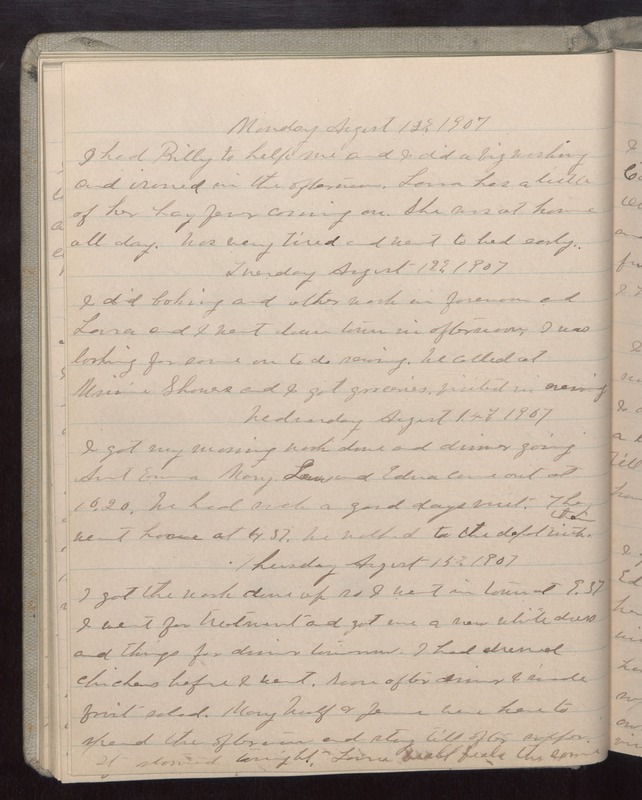 Monday August 12 1907 I had Billy to help me and I did a big washing and ironed in the afternoon. Lorna has a little of her hay fever coming on. She was at home all day. Was very tired and went to bed early. Tuesday August 13 1907 I did baking and other work in forenoon and lorna and I went down town in afternoon. I was looking for some [one?] to do sewing. We called at [illegible] Showers and I got groceries. visited in evening. Wednesday August 14 1907 I got my morning work done and dinner going Aunt Emma Mary Law and Edna came out at 10.20. We had such a good days visit. They went home at 4.37. We walked to the depot with them. Thursday August 15 1907 I got the work done up so I went in town at 9.37 I went for treatment and got me a new white dress and things for dinner tomorrow. I had dressed chickens before I went. Soon after dinner I made fruit salad. Mary Woolf & Jennie were here to spend the afternoon and stay till after supper. It stormed tonight. Lorna [illegible] feels the same.